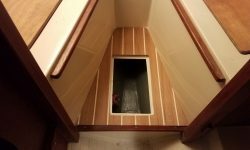 I spent the morning working on the cabin sole, starting with the openings for the several hatches in the main section. 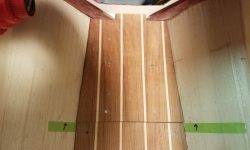 I cut just inside my layout lines and test-fit the sole to be sure the layouts were correct before completing all the openings as needed. 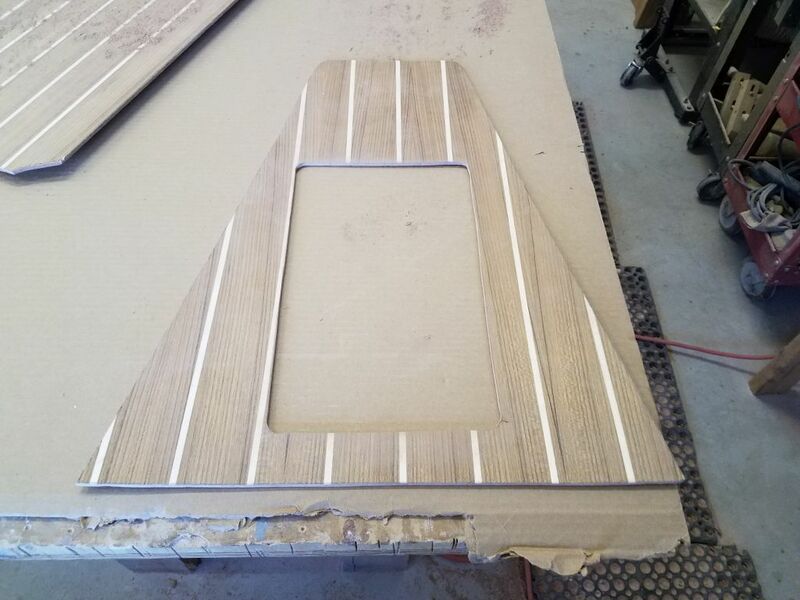 For the forward cabin, I cut out the hatch opening and the small veneer section and test-fit as required. 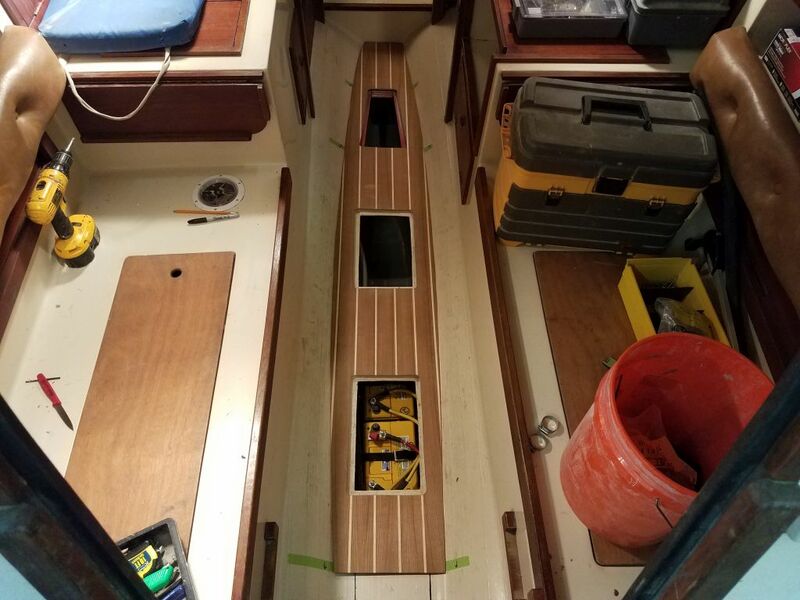 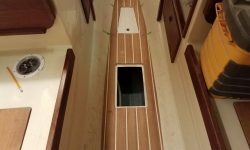 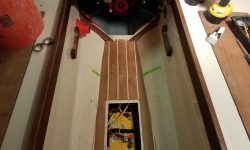 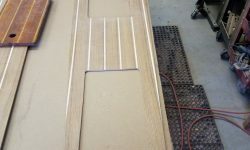 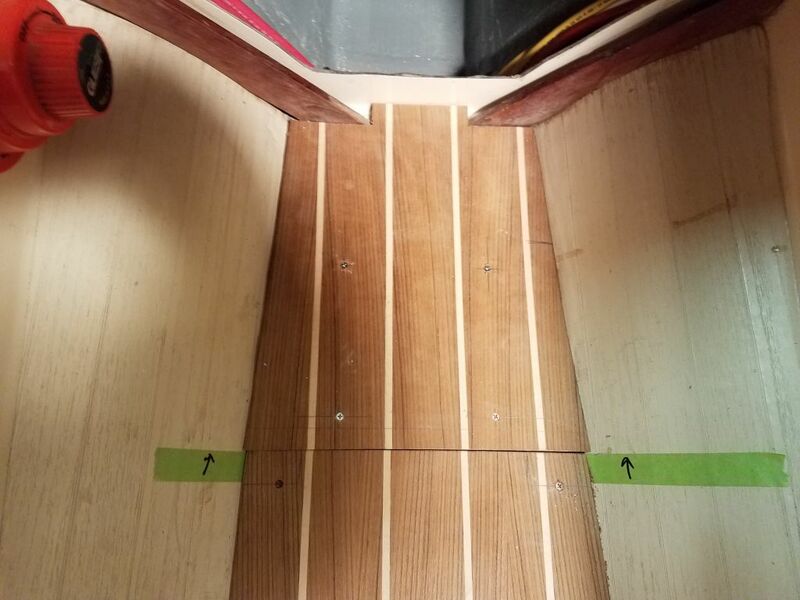 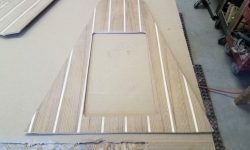 To align the new veneer on the newly-cut forwardmost hatch in the main cabin, I set the hatch itself in place, and made reference marks so I could later align the veneer with the wood strips on the adjacent cabin sole. 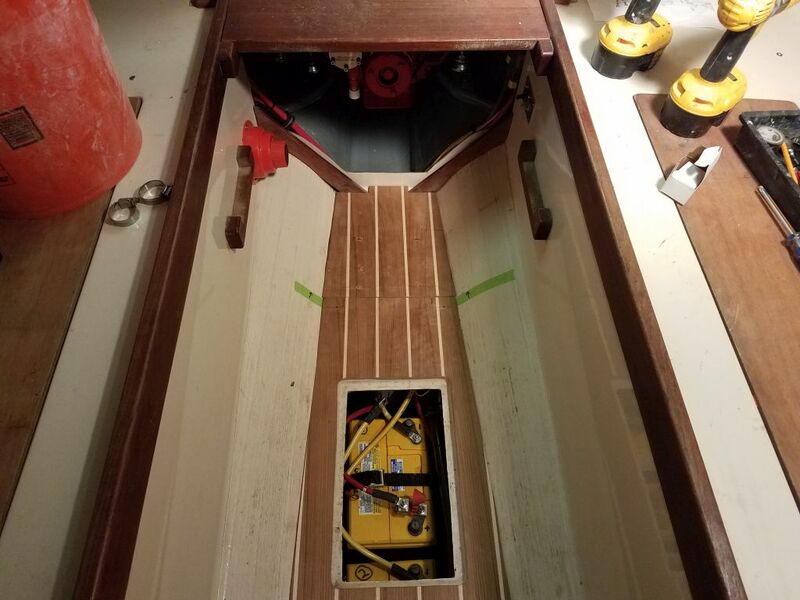 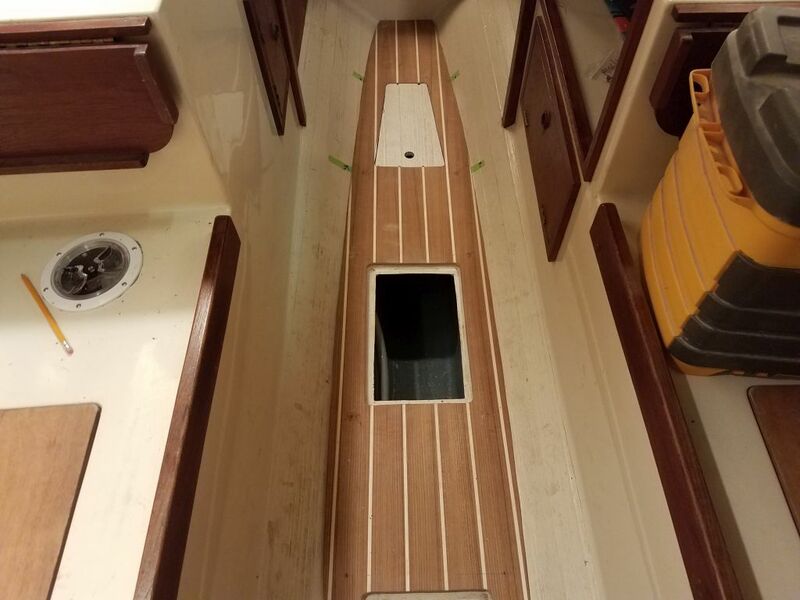 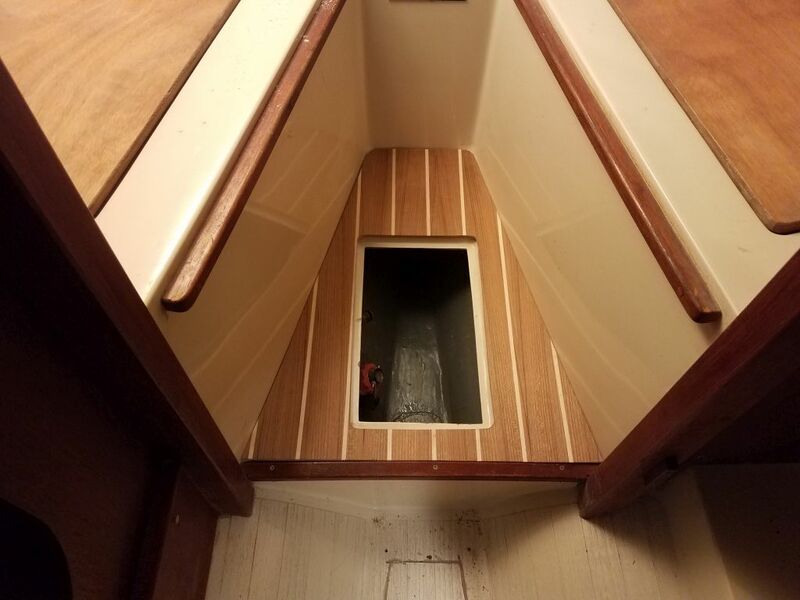 At the aft end, just forward of the engine room, I attached the small section of new veneer to the hatch cover with screws, so that the entire section would lift out as a unit for access. 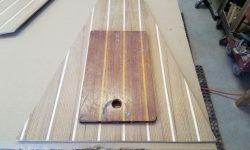 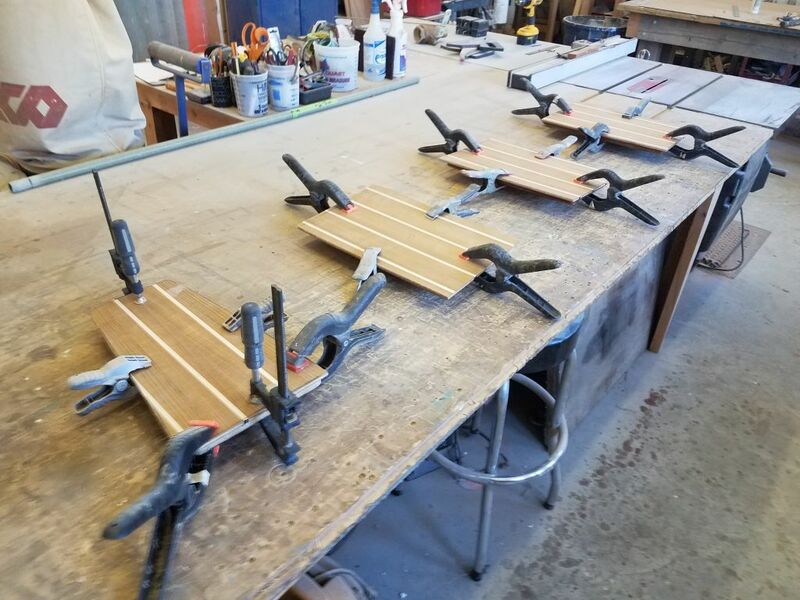 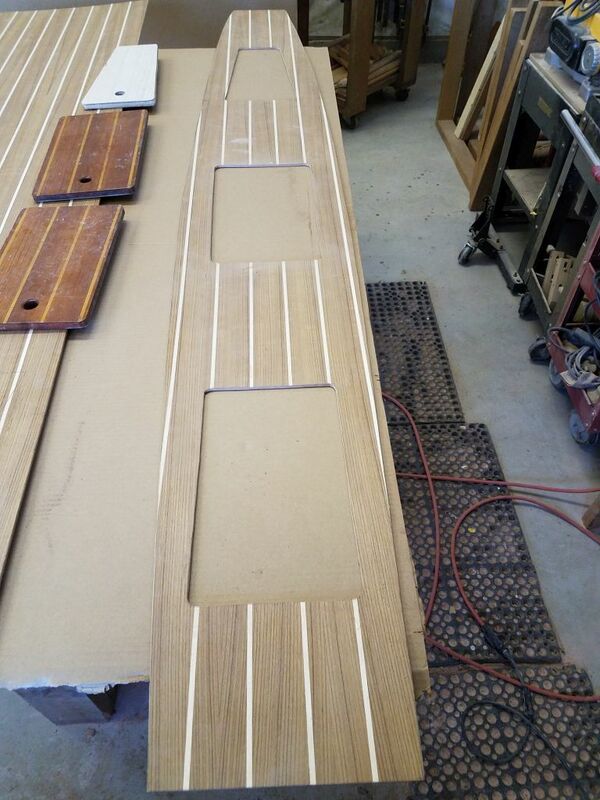 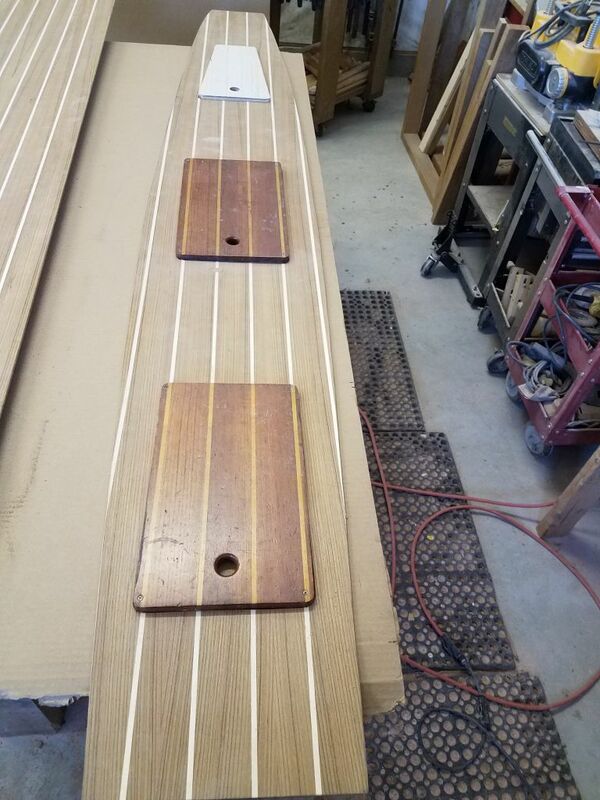 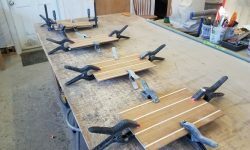 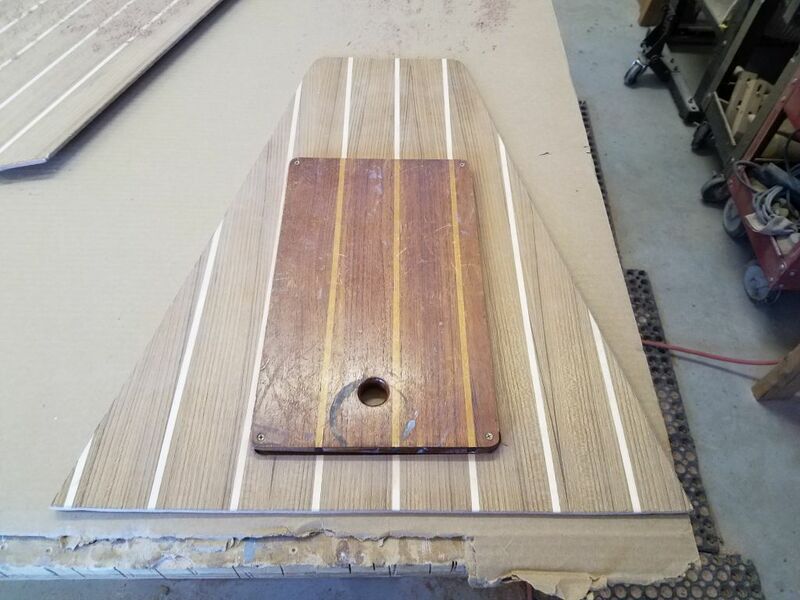 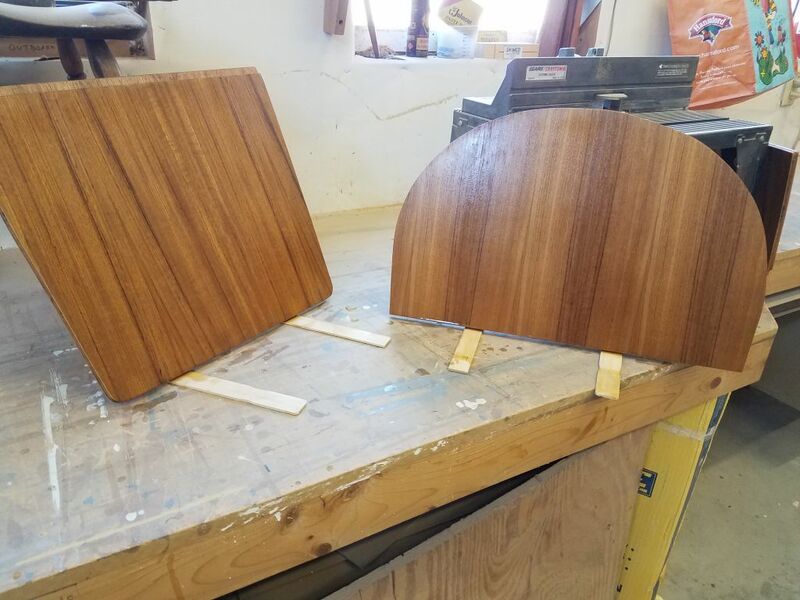 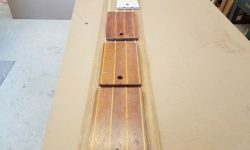 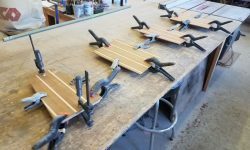 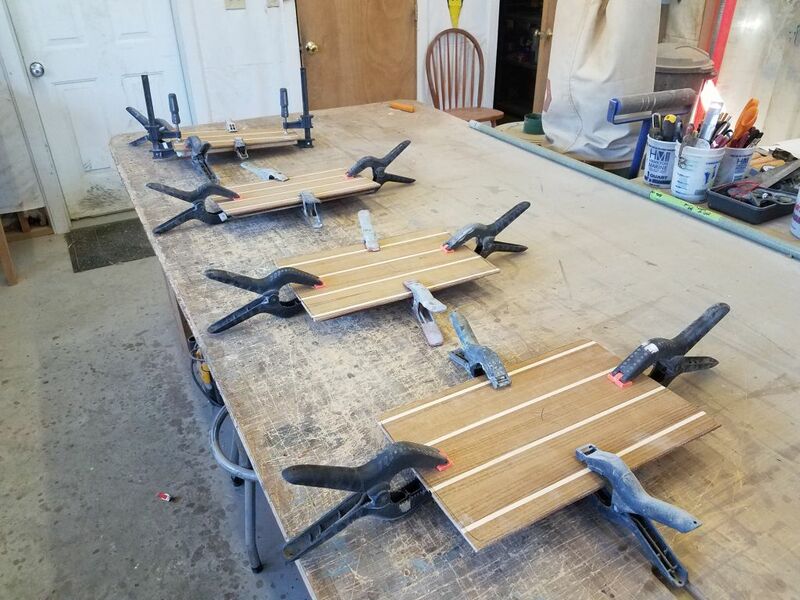 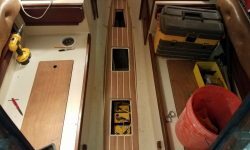 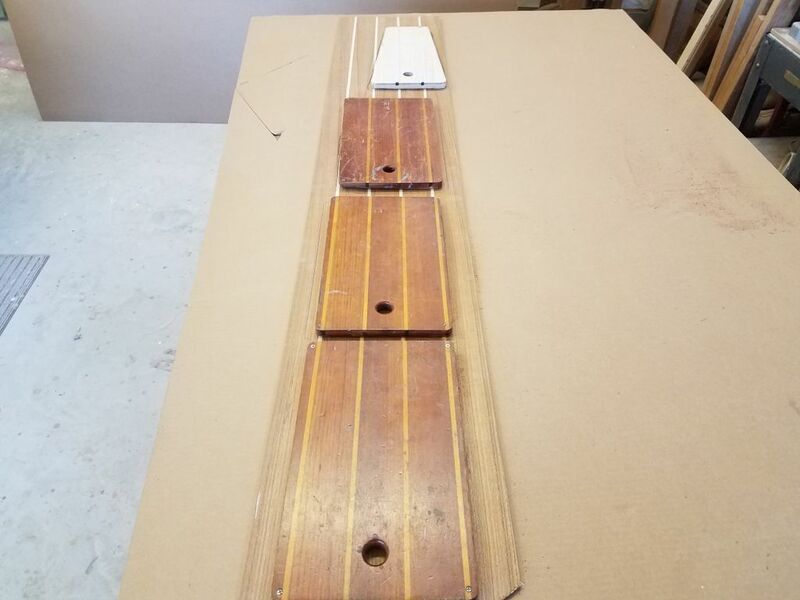 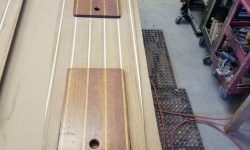 Now I laid out a strip of the teak plywood veneer to accommodate all four hatch covers, and cut oversize blanks for each that would allow me to align them properly. 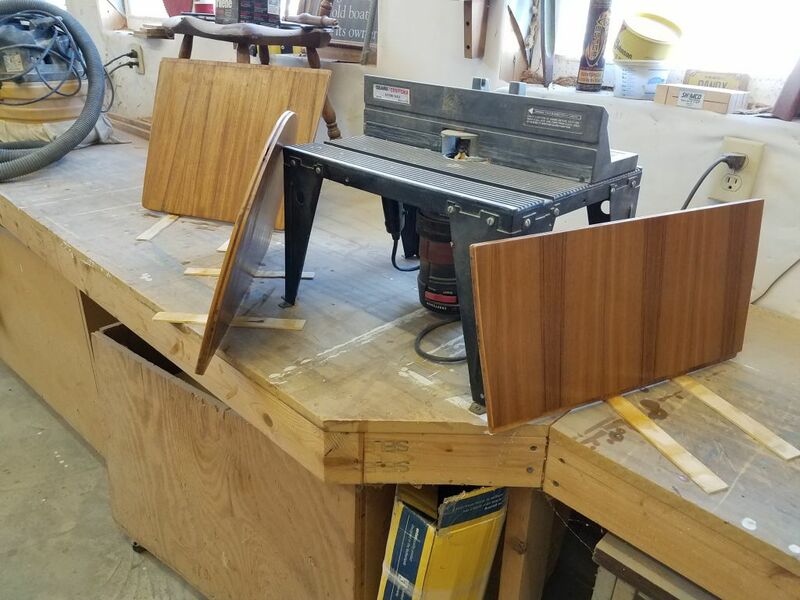 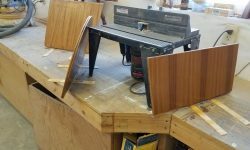 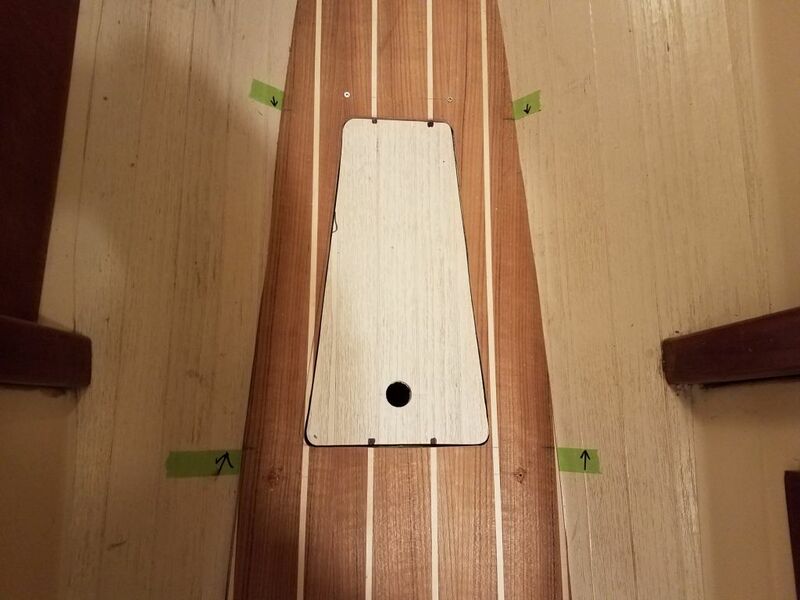 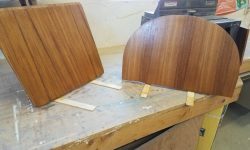 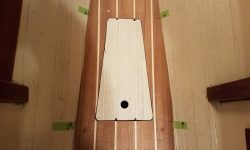 It turned out that the old veneers were glued in place on the plywood hatches, so I ran them through the planer to remove the old 1/4″ veneer and make room for the new before laying out and gluing down the new plywood along pre-determined layout lines. 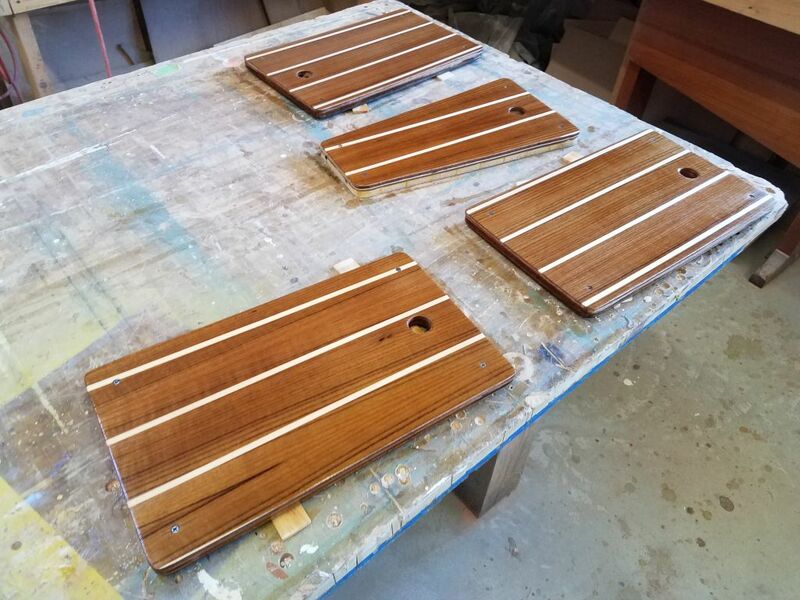 While I left the glue-ups to dry, I finish-sanded the sole pieces, cleaned them, and applied a sealer coat of varnish to all sides. 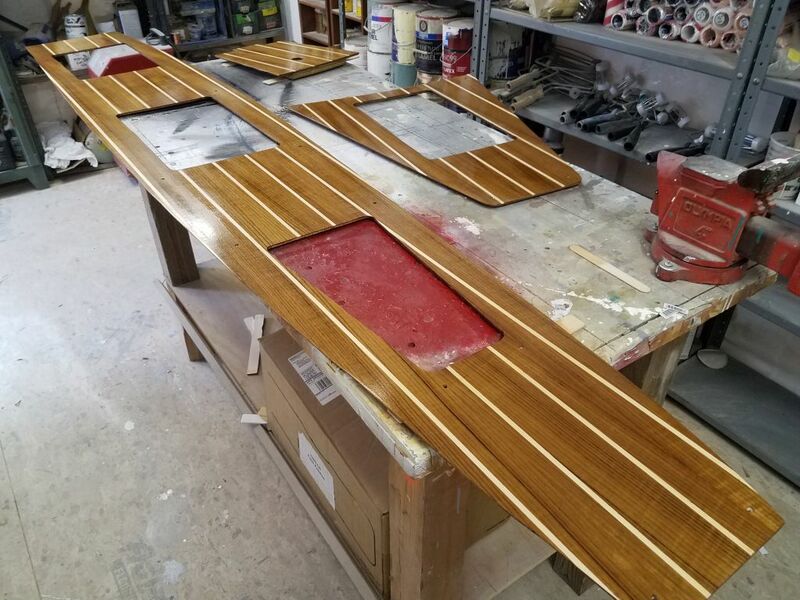 The owner requested only the sealer coat in order to finish up the coats himself, so this would be all the varnish I’d be applying at this time. 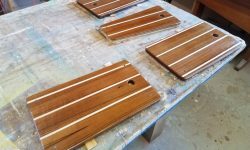 When the waterproof glue on the hatch covers had dried sufficiently, I trimmed the excess veneer with a router to complete the hatches, then sanded and seal-coated these as well. 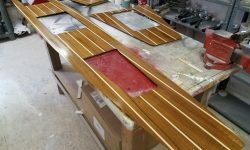 To wrap up the woodwork, I also applied a sealer coat of varnish to the new teak companionway boards. 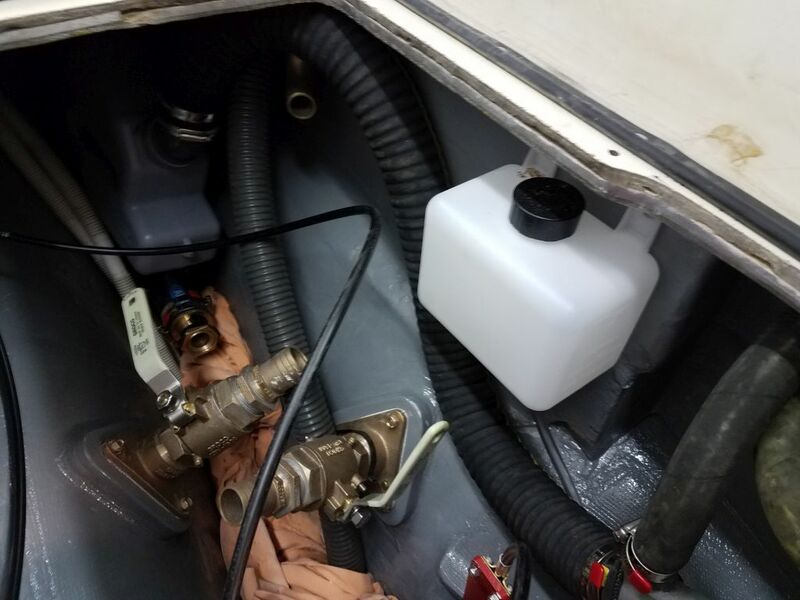 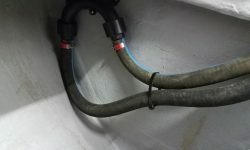 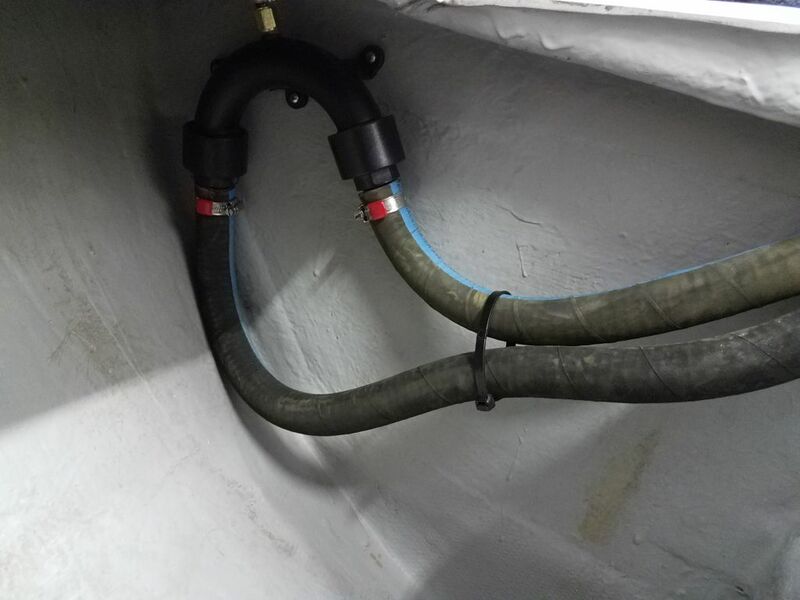 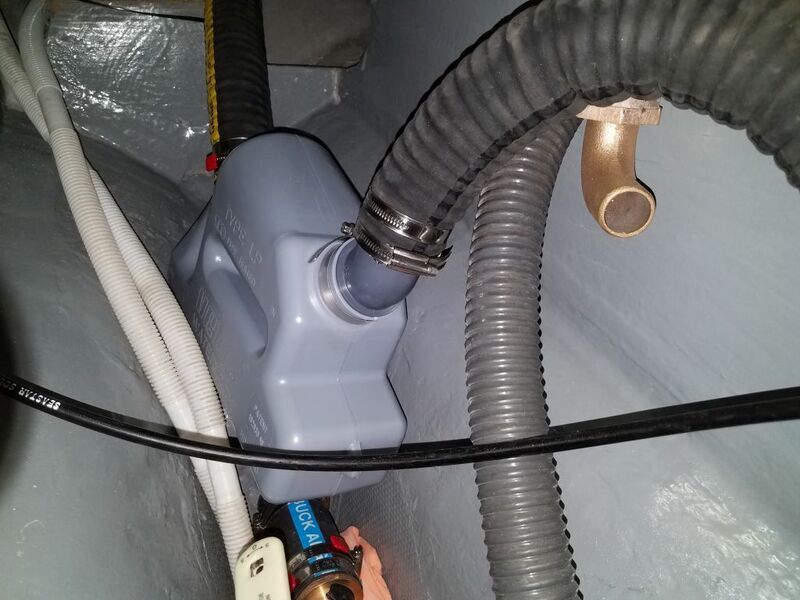 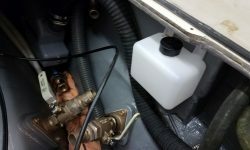 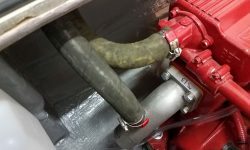 In the engine room, I finished up the hose runs for the vented exhaust loop, cutting the hoses to final length and securing all connections with hose clamps. 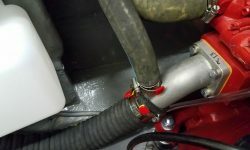 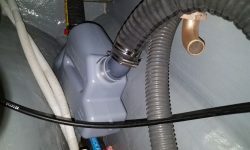 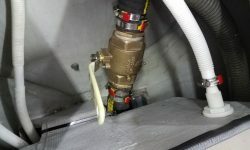 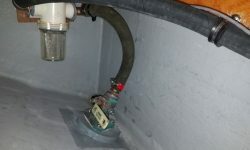 I completed the exhaust system by installing the shutoff valve in the lazarette, where I’d prepared the hoses earlier, and making up the final hose run between the engine outlet and the exhaust muffler below the cockpit sole. 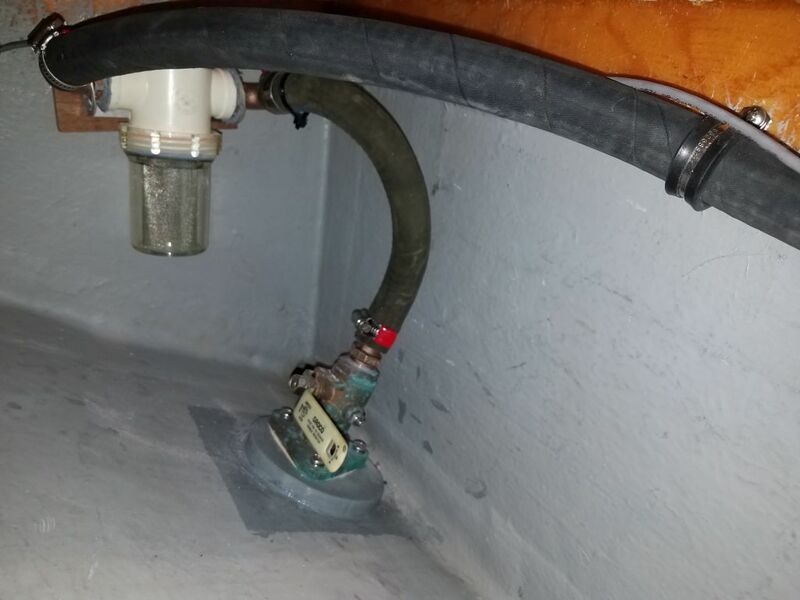 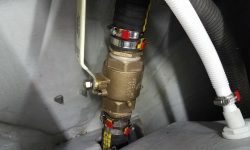 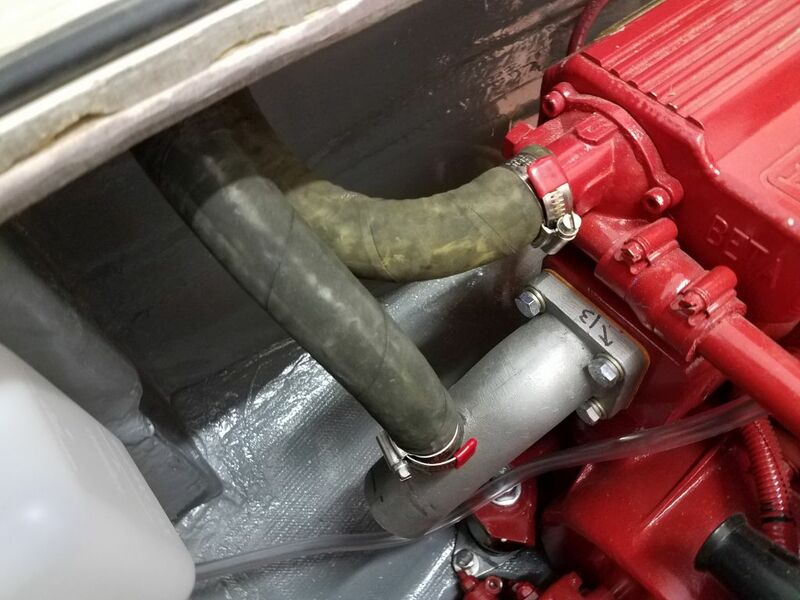 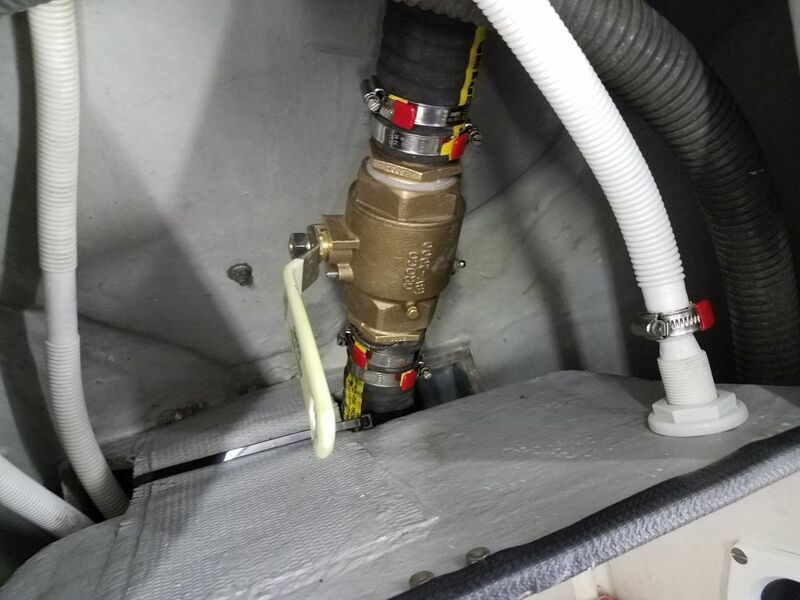 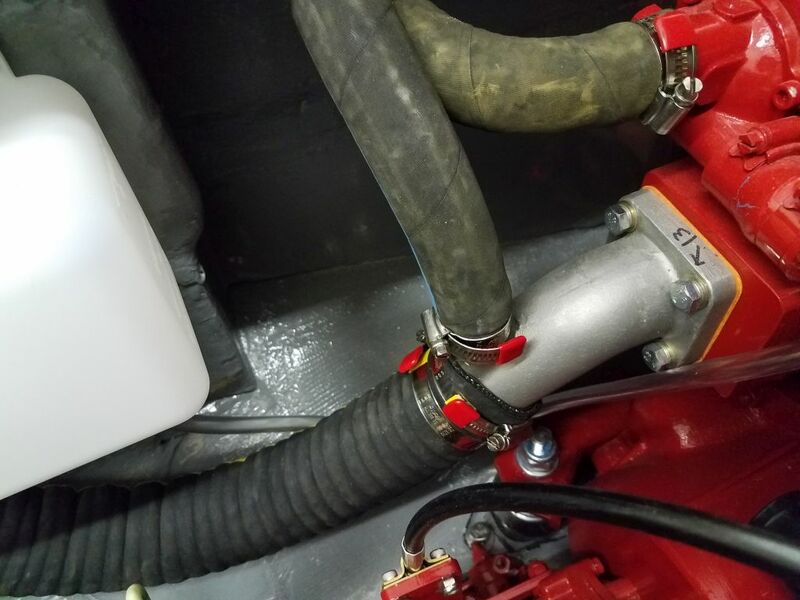 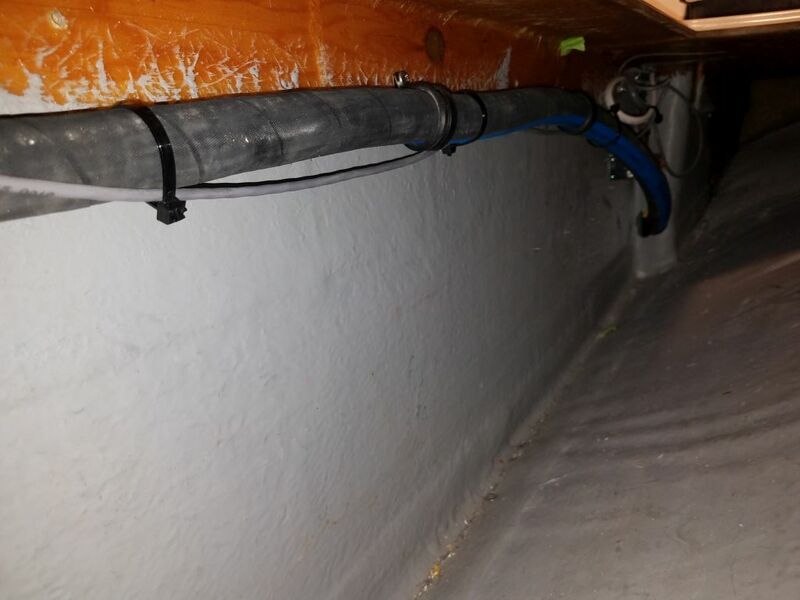 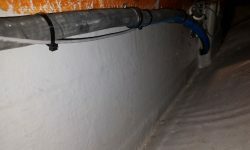 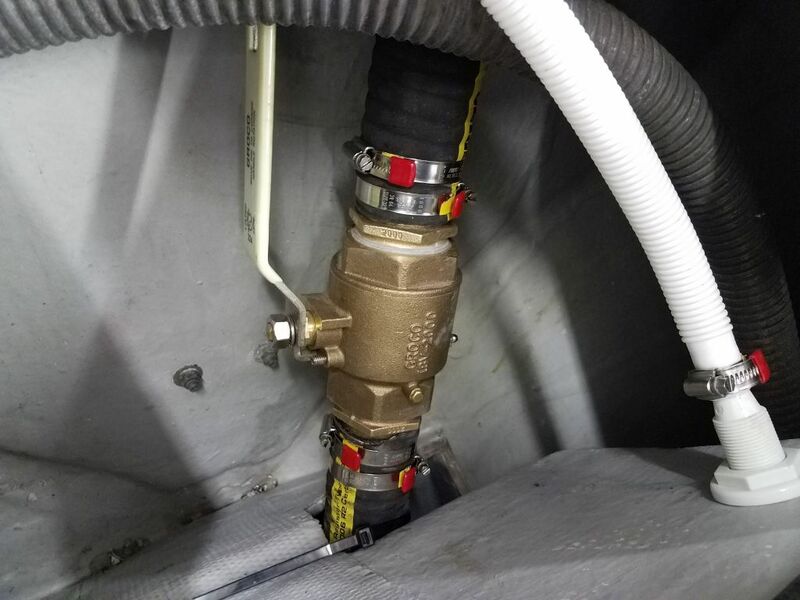 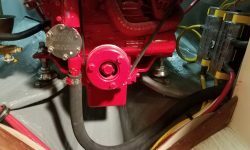 To finish up the engine work, I installed the final length of raw water intake hose, running between the sea strainer and the raw water pump on the engine itself. 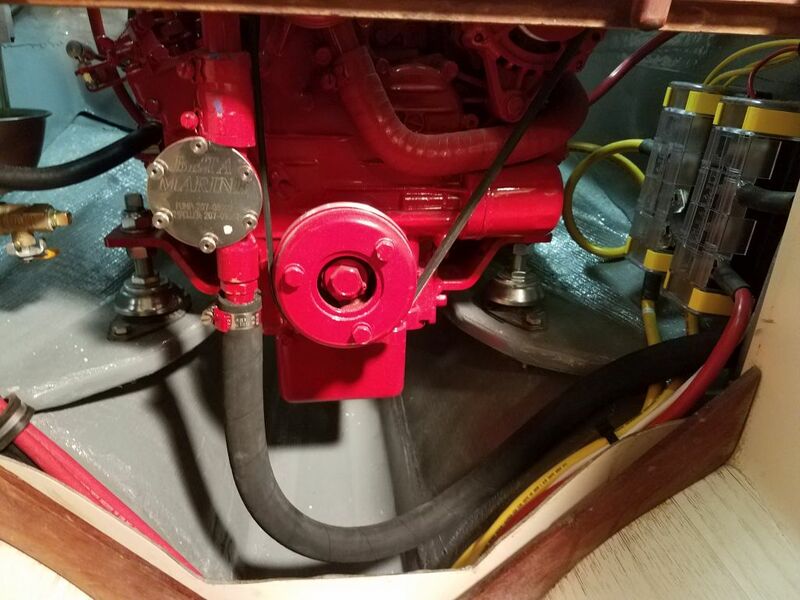 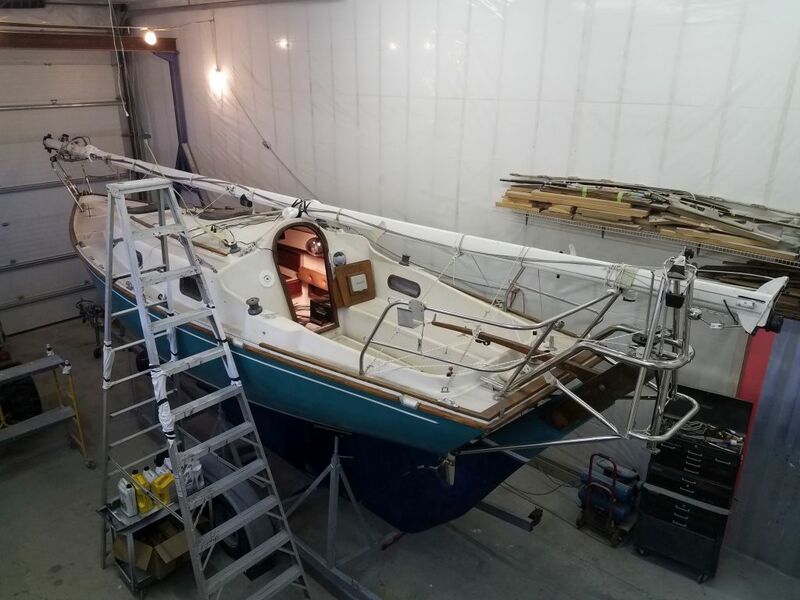 Engine-wise, all that remained was to install the shafting, which was being machined (or soon to be machined), and propeller, along with final alignment.